Michael Linklater, a member of Saskatchewan’s Thunderchild First Nation, was drafted Saturday. Michael Linklater can finally boast that he has been drafted by a professional basketball franchise. Somewhat ironically, Linklater, a member of Saskatchewan’s Thunderchild First Nation, was drafted in what will in all likelihood be his final season of playing high level basketball. 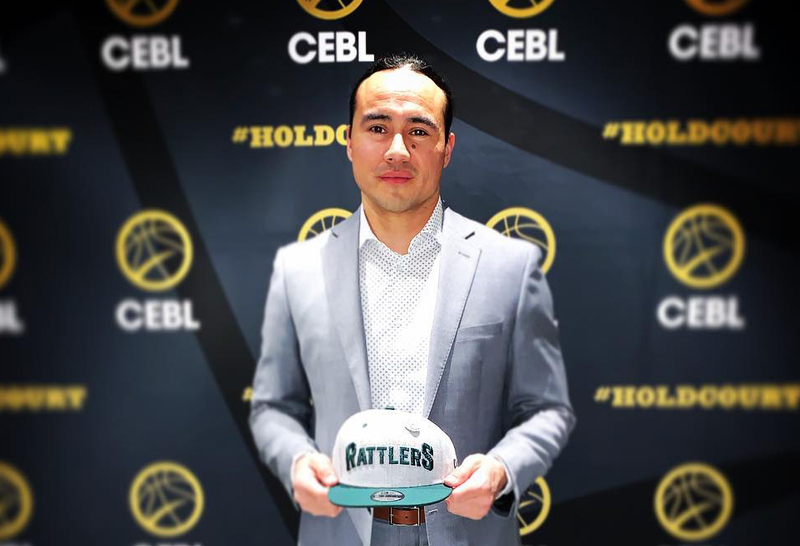 Linklater, 36, was selected by the Saskatchewan Rattlers of the Canadian Elite Basketball League (CEBL) this past Saturday. The CEBL, a professional loop, is gearing up for its inaugural season, which kicks off in May. The Rattlers, who will play their home contests in Saskatoon, are one of six squads that will take part in the circuit’s first season. Linklater confirmed to Windspeaker.com that 2019 will be his final season on the courts. “My body feels great but my heart is with my children,” Linklater said of his decision to retire from basketball near the end of the current year. Linklater is a single father who has shared custody of his four children, ages 8, 10, 12 and 14. Linklater, who won a Tom Longboat Award as Canada’s top Aboriginal male athlete of the year in 2018, said his decision to retire could be pushed back somewhat. That’s because he is also currently Canada’s top-ranked 3-on-3 basketball player. He frequently travels throughout the world competing in various 3-on-3 tournaments. The sport will be making its Olympic debut at the 2020 Summer Games in Tokyo. If Canada does end up qualifying a team for that competition, Linklater would postpone his retirement in order to take part in that event. Linklater was still excited about the fact he was drafted by a pro team, even if it is not in the circuit he dreamed about while growing up. Linklater knew that the Rattlers were interested in drafting him this past Saturday. That’s because Saskatchewan’s head coach/general manager Greg Jockims had reached out to Linklater to gauge his interest in joining the club shortly after he was hired in January. Jockims knows Linklater well. Jockims was the head coach for the University of Saskatchewan Huskies when Linklater played there for two seasons. Linklater guided the Huskies to their one and only national championship back in 2010. The Rattlers, however, are expected to have three practices per week. And all clubs in the CEBL will play a light 20-game regular season schedule. “So 10 of those games will be at home,” Linklater said, adding his children were given votes and they were all keen on having their father join the Rattlers’ organization. The CEBL’s first season will include three Ontario-based franchises. They are the Guelph Nighthawks, Hamilton Honey Badgers and Niagara River Lions. Also taking part will be Edmonton Stingers and British Columbia’s Fraser Valley Bandits. The Rattlers kick off their 2019 season on May 9 with a home contest against the River Lions. A men’s professional basketball league already exists in Canada. The National Basketball League of Canada, founded in 2011, has 10 clubs competing in its current season. That league, which features rosters primarily stacked with American players, has had hit and miss success in terms of attendance with various franchises since its inception. Linklater believes the CEBL can succeed because of its ratio of homegrown talent. Linklater will continue to play with his Team Saskatoon in international 3-on-3 tournaments. Those events begin in April and continue until November. “We have to decide which tournaments we want to go to,” he said. Besides his family commitments, as well as his 3-on-3 and Rattlers’ responsibilities, Linklater will continue to serve as a councillor for the Thunderchild First Nation.